The Unitarian church of Underwood is a welcoming community of diverse people where our celebration of life and common search for meaning bind us together. The Unitarian Church of Underwood is a fellowship of seekers after truth, bound by no dogma, restricted by no creed, following the dictates of their own conscience. The purpose of this fellowship is to bring religious liberals into closer acquaintances and cooperation. Relying upon reason as our guide, and upon freedom as our method, we seek to grow in understanding of ourselves and of our neighbors and to serve our community. Unitarian Universalist congregations affirm and promote seven Principles, which we hold as strong values and moral guides. We live out these Principles within a "living tradition" of wisdom and spirituality, drawn from sources as divers as science, poetry, scripture and personal experience. As Rev. 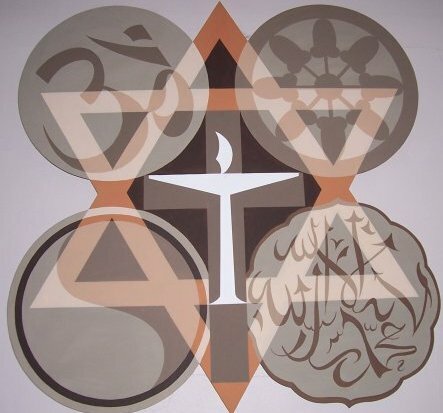 Barbara Wells ten Hove explains, "The principles are not dogma of doctrine, but rather a guide for those of us who choose to join and participate in Unitarian Universalist religious communities." Direct experience of that transcending mystery and wonder, affirmed in all cultures, which moves us to a renewal of the spirit and openness to the forces which create and uphold life. The picture above is of the wall hanging in the front of our sanctuary. It was created by Fergus Falls artist Charles Beck and is called "Conglomerate of World Religions". The idea came from a mid 1970's Unitarian Universalist Christmas card. 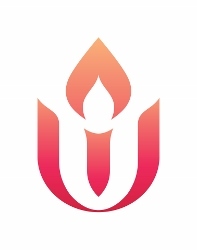 A flame within a chalice, represents the Unitarian Universalist Association (UUA) and is a symbol of the Unitarian Universalist faith. The image to the left is the current official UUA logo, but congregations often use other images of the chalice. Because of this, you may see many different styles of flaming chalices. We have a legacy of "deeds not creeds." Our work for a better world calls us to unexpected places as we harness love's power to stop oppression. From grassroots community organizing to interfaith state, national, and corporate advocacy; in protest marches, prayer vigils, and press conferences; in homeless shelters and in prisons, Unitarian Universalists put our faith into action. Our ministry includes service, education, advocacy, and public witness (the spiritual practice of taking a public position in support of justice). Our Standing on the Side of Love campaign harnesses the power of love to end oppression. Our UU College of Social Justice provides experiential learning opportunities to deepen the work of justice for people of all ages. Our work is led by our denominational staff, congregational leaders, and a wide variety of coalition partners and UU groups focused on justice and identity. The right of conscience and the use of the democratic process within our congregation and society at large.